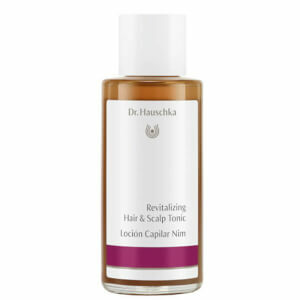 Achieve sleek, radiant locks with the Revitalising Hair and Scalp Tonic from Dr. Hauschka. Infused with neem leaf, the treatment strengthens keratin and prevents breakage, whilst a blend of rosemary, borage and horse chestnut promote healthy hair follicles and improve manageability. Enriched with arnica and birch bark extracts, the powerful formula works to nourish and rebalance an oily or dry scalp, restoring long-lasting comfort. Non-greasy and lightweight, you can expect calm, invigorated tresses with luminous shine from root to tip. E.N. Free from synthetic fragrances, dyes and preservatives, mineral oils, parabens, silicone and PEG. Massage into damp or dry hair and scalp. Part hair and distribute a small amount of tonic evenly over the scalp. Gently massage lotion into the scalp with fingertips. Do not rinse. Apply more generously to help control frizzy hair.